Science Fiction - ZineWiki - the history and culture of zines, independent media and the small press. 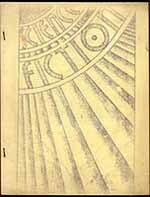 Science Fiction was one of the first generation of science fiction fanzines. It was edited and published by Jerome Siegel (1914-1996) from Cleveland, Ohio, U.S.A.
Jerome Seigel had been one of the early subscribers to The Time Traveller, which was one of the first fanzines to appear right after the release of The Comet in 1930. Seigel was inspired by The Time Traveller to create his own fanzine which he called Science Fiction. The first issue was published in October 1932. The fifth and final issue appeared in early 1933. Seigel went on to partner with Joe Shuster to create one of the best known superheroes, Superman, and issues of Science Fiction ran the first Superman stories and art. Contributors included Forrest J Ackerman (Imagination! ), Eugene I. Frank, and Hugh Langley, with letters from Dan McPhail and Louis C. Smith. This page was last modified on 30 July 2012, at 23:04.